Why not watch some classic clips from Classical times as interpreted by Hollywood? Ben Hur has a fantastic battle between Romans and Illyrian pirates. Anthony and Cleopatra has the battle of Actium. From 2'15'' in this clip. Ben Hur 1925 Pt6&7(silent) epic seabattle. Watch for oar-raking, ramming and heads on swords. Oceanus Strategoi : Nice rules which could work well with 1/300. These have taken a lot of thought to get the game-turn sequence sorted out. This is crucial in getting an atmospheric and accurate game so I-Go-U-Go wont work. The solution here is designed to work with a multiplayer game and seems rational enough but the rules include detailed method for working out complex interactions. These rules are concise, though. A nice aspect is the idea that a ram atack is uncertain in its success from the start and an aspect often missed is the observation of an attack by the victim before they can react. I am less enamoured of using 'factors' for crew and many things are calculated using formulae - even though these are fine and seem realistic in themselves. These rules are wel worth a try, free, concise and cover most things one would want. There is little 'colour' in them, however. Ramming Speed are short and sweet with less complexity than OS. They are for 15mm ships and could be said to be 'skirmish' level rules. Most things are dealt with ina straight-forward manner but because of the 15mm scale deck fighting and shooting would require some changes for 1/300 to emphasise groups instead of individuals perhaps. The rules allow sailing in connection with a battle. Complex moves would be a problem in 1/300 I think because each inch of 1-24 inches possible is ordered and moved individually. Probably a fun set for 15mm or Zveda's 1/72 models. Andy Watkins Trireme rules are great. Deceptively short and sweet. He does prefer a hex grid which gets him out of some movement problems neatly but this is a nice rule set. The game turn sequence is dealt with very nicely - almost the same solution I have devised - but is unclear on resolving problems with ships moving at the same speed. Shooting and fighting is simple so the next turn can be reached before long. These would be my preferrred rules with my old navwar 1/1200 and Andy has nice pics of his own Langton models on his webpages. There is little complexity but most things are dealt with and fleet action could be done with some excitement generated. However, they are not, without some modification, what I would use with 1/300ships. NAUTA, FIGHTING FLEETS and CORVUS are all rules which allow for using a large number of ships and are necessarily simple. 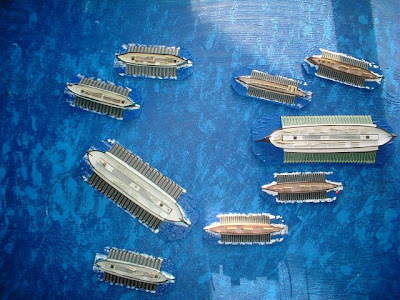 If one wants to direct 50 or so ships on a tabletop this may be the way to go but I find them sterile. 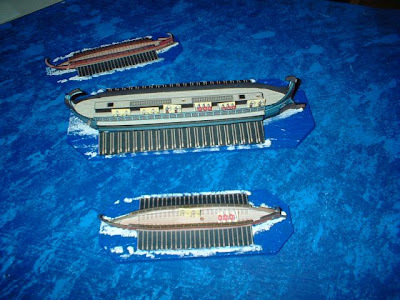 1/1200 or 1/650 scale ships are small but the appreciable size of Hotz ships in 1/300 brings them to life. Once the individual oars and planks are visible I find it a shame if one does not seek to add some detail and realism to any rules used. At 1/300 the deck crew can be represented, sails set or struck and the ships look much more colourful these are ships, not just counters. DEATH ON THE SEAS by Tom Hinshelwood are billed as 'skirmish' rules but I think they are ideal for Hotz ships. They have crew characteristics and plenty of detail without getting petty. Ancient naval rules drown in detail. It was not a ponderous activity like Napoleonic naval warfare when floating castles drifted past each other blasting away. Galley warfare was positional, highly tactical and included explosive bursts of activity even if there was no gunpowder available. Figures for deck crew can be provided by 6mm metal figures. Everything required is currently available unless one is ludicrously fussy about invisible details. However, I have a penchant for card/paper figures and the Hotz ships being card I think it is highly appropriate to use card/paper for my crews. If you have not been there yet I urge you to visit Junior General where all sorts of wargaming stuff is available to print on paper. 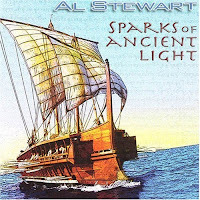 There are even sets of ancient ships and a scenario and rules for the battle of Salamis ! At Junior General I got appropriate figures and scaled them down to 6mm. I set a pale yellow background around them which makes them show up but is not intrusive. I then printed them on good quality paper so the ink did not run - photo paper is good. Then spray them with a sealant such as varnish and let them dry. Several thin coats is best so the ink does not run. The small cards must now be made to stand up. Either fold them and let them stand as little tents or, much better, use superglue to stick them on small transparent acetate rectangles. Dead cheap, same material as the ships and you can even edit the men to stand or have the colours you like. Machines and other stuff are available too. All credit to JUNIOR GENERAL ! To make a convincing sea just takes some acrylic based paint and an old sheet. The Mediterranean is a beautiful colour in the summer sailing season so don't settle for a dull gray or washed-out blue. Ultramarine or turquoise when diluted give great colours. Using a king-sized double sheet and match-pots makes for a cheap large sea. The sheet should be fine weave cotton, not synthetic or it wont absorb the paint. Mix half a litre of acryclic based paint of a Mediterranean blue colour and the same of water in a bucket. The sheet should be light blue or white. Yellow may work ok as long as the shade is not to dark. Dampen the sheet without making it soaking then either scrunch it up or use clamps or clothes pegs to hold parts if it in rough pleats - not all in the same direction. Stuff the sheet into the bucket and ram it down. Immediately lift it up and let the paint drain back into the bucket. Do this again several times. The sheet will probably soak up all the paint. Then squash the sheet up and down in the bucket to squish the paint well into the fabric. 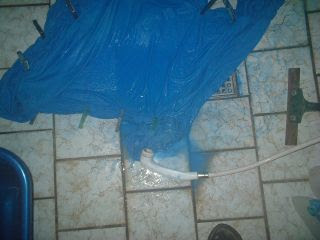 Let the sheet drain as a mass roughly held up over somewhere it doesnt matter that blue drips spatter all over. Next day the sheet looks a bit congealed and partially drying out. Use a watering can or shower head to spray on it a little, turn a few times , spray a few times - not too hard or to long. This takes some paint off and gives shading. Hang the mess up again until it look like it is nearly dry. 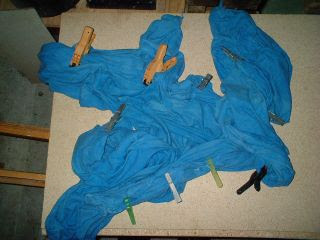 Take off the pegs or clamps and spread the sheet to dry. You should have a sort of tie-dyed sea. Repeat with thicker paint if the shade is not what you want. The sheet will feel starched but not rigid. Iron the sheet and use elastic sheet straps to keep it taught over the board. Store it on a stick, rolled around or scrunch it up but neat folding makes a lousy-looking grid of creases on it. There are so many different ship designs, and arguments about ship designs that it is necessary to group them for performance. I don't want 20 different turn templates. MINOR will include all smaller ships up to a hemiolia. Tight turning. TRIREME will cover the Trihemiolia and Trireme. ALso quite tight turners. MAJOR includes 4's, 5's and 6's which the Romans called nava majoris. Having drawn up the templates using a variety of sources on naval architecture I am happy with them. 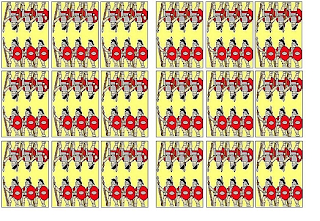 The MINOR ships can get round more than 90 degrees in one move segment. The Trireme class make 90 degrees. The MAJOR can make about 60 degrees. Alexandrines 45 degrees subject to somemore research. I am in favour of anything which saves time and paper and anything which adds a little atmospheric gimmickry to a game. Therefore I decide to put as much of the game mechanism into a small wheel-dial device for determining ram-speeds, ram effect modifiers and whatever else I can cram into it. The device will be made to look like the Antykithera computer. It can be called the ABC - Antikythera Battle Computer ha ha. The same device can be used to measure angles for shooting, ramming etc. A grid solves this problem but I don't want a grid. How does one manage turning models without leaving rom for argument or making things impossibly complex ? I tried with perspex templates. They look and feel great. BUT they are too cumbersome. Tried with thick acetate - much better. Transparent and flexible. Should be laid on table. To reproduce a ship's course in a turn the inside-curve type is not appropriate. Tiles coul dbe good but many types needed. They should be available in quarter-moves for each ship type. Practicalities speak against them. A track-type with apropriate width to show how the ship pivots is best. I mark quarter-moves on so any simultaneous-moved disputes can be resolved. Ramming should be deadly to the target if executed correctly. A wooden ship with a large hole on the waterline will become unmanageable and sink down to the waterline if not heaily loaded . The result of a ramming attack should be generally successful or not with no intermediate result. The resistance of the target to a ram will be dependant upon the relative masses of the ships and their collision speed. Lighter ships will come off worse usually. Armoured or thickened wales will be a significant defence according to Shaw et al. Acute angles of attack require higher speeds to be effective. The rams is external to the ship structure and it may be lost in extreme collisions but that will not usually hole the owner. 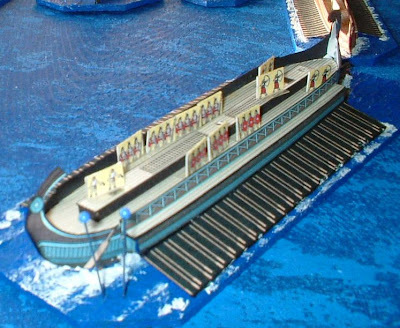 In 373BC Iphicrates cut off the beaks of captured triremes and then towed them off as trophies - obviously no sinking occurred there. A good crew will be better able to rapidly extract their ram from the target. High rams designed to get to grips with the enemy and low rams designed to sink the target. A ram is fitted outside the ship's structure and its loss will not hole a ship necessarily. A crucial aspect which highlights the capabilities of different ships. Turning should not be complicated but should not fail to show differences between ships and crews. In some rules turns are achieved with a template, in others with angular measurement, in others a grid is there for guidance. A template is the answer because I dont want to use a grid and it provides a solid reference which avoids measurement disputes. When a ship turns it does not just go round a track like a railway waggon but pivots as it turns - this should be covered. As should the ability to turn in place. Turning at the extremes of the ships capability will reduce speed and may be uncertain due to the reactions of the oarsemen, waves and the helmsman. This could lead to uncertainty of some kind in achieving a turn which is relevant at 1/300 scale but might not be at 1/1200. Should I use a grid or have free movement on the tabletop ? An easy decision. A hex or square grid or a point pattern is a way of simplifying movement and reducing squabbles. However, it does not allow the freedom of movement which is an essential feature of a sea battle. Vehicles follow roads and men must march around trees but the sea surface is equally available to all ships in all directions. To cut down course choices to 30 degree chunks and not allow some intervening courses where hexes do not lie does not fit with my idea of moving model ships. Simple. Aesthetic considerations come in here too. Great models need not be overshadowed by a grid. Practicalities also figure. A dyed sheet can be used instead of a bought grid mat or one laboriously drawn out . MOVES : cm or something else ? The way the models should be moved could be done with a ruler and a list of speeds in cm. I dont want lots of rulers and tapemaeasure on the tabletop. Fussing about mm should not be an aspect of the game. A template for turning should include a straight course measurement. Moving should be in arbitrary 'ship lengths' based on Olympia, a 3. In one move segment, if the ship can move, it will cover a standard ship length and this will be a resaonable distance on the table. 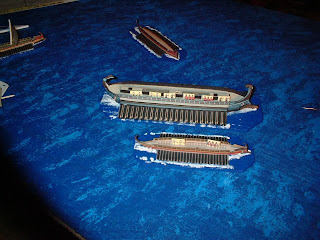 Thus in one full turn a ship could charge 5 ship lengths across the table which would be something like 75cm. That is enough to give some dynamism to the game and stay away from nudging things around at snail's pace. With a ground scale of 1/300 it is necessary to keep the time interval used short enough so that it is not overly complex, where lots of things can happen within a turn that have to be synchronised. On the other hand if the interval is too short nothing significant happens. My choice is for a game turn of 2 1/2 minutes which is composed of 5 movement segments. This is a result of considering the real performance of the trireme Olympia. She can turn 360 degrees in 2 minutes or so. Thus if I allow a 90 degree turn which is significant on the tabletop to be achieved in one movement segment and a complete circle to be steered in one turn this gives me my game turn length. 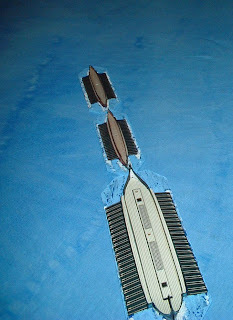 In 30 seconds a trireme travels a bit more than its length at cruising speed, that is OK too. In 30 seconds an archer can shoot a few arrows and a ballista shoot once, that fits OK. It fits too with the time to run across a ship's deck, set an oar in or out etc. Should the groundscale be the same as the ships or more reduced ? The answer to this one has to be 'the same'. 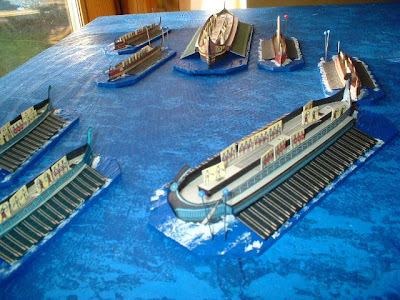 Then the best can be got out of the models and no adjusting for the presence of several ships under one model etc. One model is one ship and the ground scale 1/300 seems the best option to start with. A place where I can bounce ideas off myself and others in connection with creating rules for wargaming 1/300 scale models of ancient ships. The models are larger than most previously available in lead and allow for detailed rules which must, however, not get so complex the game is not fun to play.